I had to get stitches last night. From a Russian dentist. It all started when I decided to do something I haven’t had much luck with before- ice skating. Many of you will remember that my last night in Moscow two years ago, I almost sent myself to the hospital skating on Red Square. Now this was only my second time on skates, and lost in conversation with my friend Andrew and a little too confident in my meager abilities, I fell. And I fell hard. I supermanned across the ice, ribs crashing against the cold, hard ground. Somehow though, the adrenaline kept me going, and I continued to skate for another half an hour, falling about every thirty seconds. After the adrenaline of the vivid Moscow night wore off, I began to feel the effects of my falls, stiffly sitting on a hotel bed, ribs screaming. Every breath shot sharp, raspy pain through my body, but somehow, I managed to drag myself to the airport and back to the U.S. (after of course a detour through New Jersey after getting on the wrong plane in Germany). Head first, my chin took all the impact of the cold, hard ice. In shock, I picked myself up, instinctively trying to assure myself that I was okay. Teeth. Check. Legs. Fine. And then I saw it. Drops of crimson blood splattered all over the frosty rink. Cody steadied me and led me off the ice, after which I was whisked away to a special room for impulsive and clumsy people like me. A nurse sat me down in front of a sink and told me to wash up. By now it was clear that I was bleeding from my chin, a nice trail of blood splattered from the door to the sink where I now sat. 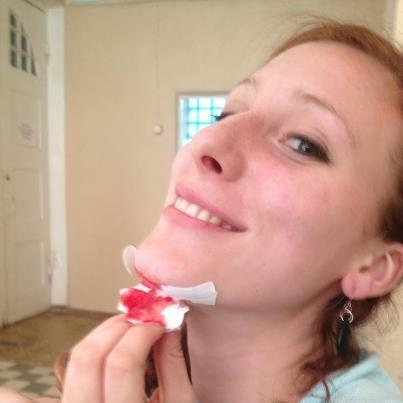 She put a temporary bandage under my chin and told me that I absolutely needed to get stitches now! At this point, it didn’t hurt, and I didn’t want to go get stitches, so Cody and I left the rink almost nonchalantly. We sat down on a bench and ate CCCP ice cream pops while waiting for my RD to pick us up and take us to the hospital. At this point, I could barely stop laughing. The absurdity of the situation mixed with the effects of a hard hit to the head made me a little loopy. I was filled with that displaced adrenaline you get when you watch an suspenseful movie but you know everything will eventually end happily. And I still had my teeth. That was enough of a happy ending for me. I’m no masochist, but there was something strangely fun about the whole incident. Cori, our Resident Director picked us up in taxi that then brought us to a drab, grey, dare I say, sketchy building. After searching through a maze of hallways, we finally found the registration desk. “No! I don’t make these rules, but I have to follow them. Only the patient!” He must have been a drill sergeant in another life. So I went in. By myself. To Mr. Scary Dentist. He sat me down in a medical chair that gave me an excellent view of the mold colored paint, peeling in huge chips off the wall. This was definitely not the newest facility, to say the very least. “What happened?” He barked. My Russian began to revert from the current third grade level to po-toddler-ski. “I-I was skating, and, and, I fell,” I stuttered. “Do I really need to? Is there any other way?” I asked. “No, you must get stitches. Объ-я-за-тель-но! Ab-so-lute-ly nec-ess-ar-y! He pounded out each syllable like a hammer on nail.” I gulped and sat back as he prepared the numbing shot. And somehow, he started to soften up. Relatively speaking, that is. “So, where are you from?” he asked, a little gentler this time. “Oh, I have a nephew there.” He made conversation with me for a few minutes, probably trying to distract me from the two shots of anesthesia to the underside of my chin. And then he got out the needle. Myth or not, I’ve heard horror stories of reused needles in Russian hospitals, and although these stories probably stem from the Soviet Era, I didn’t want to risk getting AIDS. And that’s when I asked the fatal question. He looked at me, clearly offended. “You just saw me take it out! We’re not barbarians here, you know!” Point taken. I shut up and let him do his dentist magic. Three stitches later, I was done. Sigh of relief. Then, thankfully, he let my R.D. in to hear his orders. Not recommendations. Orders. His voice became firm, loud and commanding again. “You must follow my orders! If you don’t, you’re not going to get better! You’ll only get better if you do exactly what I say!” He prescribed me antibiotics and some antibacterial liquid, and in the meantime, became very friendly with my R.D. He started to chat with her, smiled, and introduced himself. “My name is Konstantine. But to you, Kost!” And then, the best part of the night. He stood up from his desk, turned definitively toward his medical closet, and proclaimed “To hell with the government!” He grabbed a huge glass bottle of some yellow liquid, and gave it to me. Government medicine he apparently wasn’t supposed to give out. He seemed pleased with his little act of rebellion as he said goodbye to us and ordered me to come back in 10 days to get the stitches out. So that was my adventure last night. Skating, falling, and having an eccentric, imposing, and yet somehow charismatic Russian dentist named Konstantine sew me up and give me government issue medicine under the table. There’s definitely never a dull moment in this country that I love. And now, here I am, typing from my old host family’s 9th floor apartment in Nizhniy Novgorod. I arrived at 9:30 this evening and I spent the night catching up with them, drinking chai with raspberry vareniye (jam), sharing pictures to chronicle the past few years, and reminiscing about our very special time together. Life is beautiful.